Drying refers to the process of removing water from any substance, even a liquid (which then becomes a "dry" liquid). Drying also applies to gases and solids. The chemical industry uses drying in sectors ranging from agricultural products and fine chemicals through plastics and paints. Methods vary with material and application. A popular form of gas drying is air drying. Dry gas is essential in chemical processing because it precludes ice from forming in instrument air lines. In the past, ice formation in instrumentation has caused plant shutdowns and emergency venting, both of which are very costly. Prism Membranes Div. of Air Products and Chemicals Inc. (Allentown, PA) attacks the problem with its Cactus membrane dryers. They dry compressed air down to dew points (at high pressure) of -40 F.
The system operates under the principle of molecular diffusion. The wet compressed air flows through small, thin, hollow fibers made from polymers. "Membrane dryers remove water vapor from gas streams by the selective permeation of water molecules through polymers," says Prism lead product engineer Dilip Kalthod. "Though water molecules have higher molecular weight compared to hydrogen or helium, their higher solubility in the polymer enables faster permeation versus all other gases. "Hence, membrane dryers can be described as molecular filters in which water travels faster than other molecules, through unlike filters they are capable of continuous operation," says Kalthod. The dry air exiting the membrane typically contains 17-20% oxygen, and its dew point (at applied pressure) ranges from -40 F to 40 F. A small fraction of the inlet compressed air permeates through the membrane and serves as a carrier gas to transport the water out of the drying system. The membrane dryer, a self-contained unit, does not require maintenance. It does, however, need an upstream coalescing filter to remove aerosols. Any liquid water that enters the Cactus dryer will reduce its drying efficiency. The coalescing filter removes water as a liquid. The Cactus dryer removes water while in the gas phase. No condensation occurs, so there is no liquid draining. Aside from instrument air applications, the Cactus dryer is also applicable to compressor systems and natural gas drying. "Membrane dryers offer several advantages over desiccant or refrigerant dryers, including lower maintenance time and expense, no moving or electrical components, no dust carry-over, silent and uninterrupted operation," says Kalthod. "They are especially suitable for operation at remote sites and for point-of-use applications." The chemical industry uses solids drying to remove water from catalysts, detergents, polymers and other fine powders, granules, and pellets. Convection using a fluidized bed is one common way to dry solids. But chemical engineers may one to consider vacuum drying. A recent innovation in vacuum drying, zeodration, comes from Zedrys (Croissy-Beaubourg, France). At its heart lies a proprietary zeolite catalyst made of crystallized clay formed naturally from volcanic ash. The zeolite adsorbs water blocking passage of product. This ensures complete drying without product loss. The process starts by loading product into a chamber and placing it under vacuum. The water evaporates easily under reduced system pressure. The water, now in the gas phase, flows from the chamber to the reactors where it is adsorbed onto the zeolites. Water molecules pass through the pores while the product is too large to pass. Adsorption is exothermic, so the reactors must be cooled. Captured heat returns to the chamber, where it increases the water vapor pressure and promotes evaporation. The zeolite catalysts are regenerated with steam or hot water. Again, the system is placed under a vacuum. Heating dislodges water molecules from the zeolite pores, while the vacuum skid (in the form of steam) pulls it away. This step produces pure, distilled water. As soon as the reactors are regenerated, they are cooled and ready for service again. The drying process need not run as a batch operation. 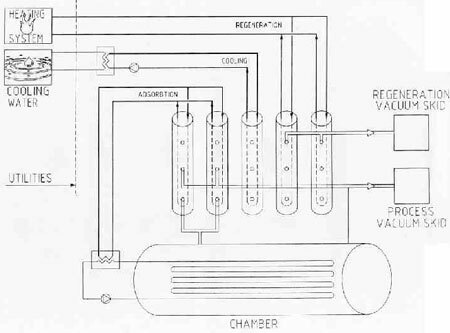 Zedrys can design the chamber as a continuous unit. While some reactors adsorb water, others can undergo regeneration. Christophe Boulanger. "It also works on products that contain another solvent apart from water. In this way, a solvent can be separated from the basic product." Liquid drying is an other important unit operation in the chemical industry. One way to dry liquids is spray drying. The objective, however, in not necessarily water or solvent evaporation, but powder formation. Like all drying, spray drying is a mass transfer phenomenon. The concentration gradient across the gas-liquid interface and the surface area of the gas-liquid interface are critical. The use of dry air for the former maximizes the concentration gradient. Dispersing liquid into fine droplets maximizes the latter. Spray drying usually takes place in a cyclone-shaped vessel (Figure 3). The liquid enters the cyclone through a spray nozzle called an atomizer. This rotary or pressure unit atomizes it into very small droplets. Dry air is forced into contact with the fine liquid droplets, which have a high ratio of surface area to volume. The extra surface area enhances the evaporation process, and the powder precipitates quickly. Air and liquid flow configurations are arranged in many different ways, depending on application. Patterns are generally co-current or counter-current, but even so, there are variations on each theme. The precise configuration must be carefully selected relative to the type of application. 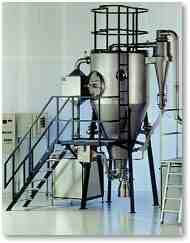 Niro Inc. (Columbia, MD) is a leader in spray drying. It offers a range of spray dryer sizes, from laboratory to pilot to large systems for industrial applications. Niro also offers flash dryers, agitated flash dryers, fluid bed dryers, and two stage dryers combining spray and fluid bed drying. For more information: Prism Membranes Div., Air Products and Chemicals Inc., 11444 Lackland Rd., St. Louis, MO 63146. Phone: 314-995-3366. Fax: 314-995-3500. Or: Chemical Div., Niro Inc., 9165 Rumsey Rd., Columbia, MD 21045. Phone: 410-997-8700. Fax: 410-997-5021. Click for a free Buyer's Guide listing.